Found main locations: Peru, Britain, Germany, Poland, Libya, Egypt and Mexico. History/Mythology: the word ‘angelite’ comes from the Greek work ‘anhydrs’ which means ‘without water’. 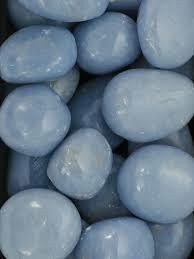 Angelite is a soft stone and will convert into a form of gypsum if left in water for to long. Try and avoid wetting Angelite. Angelite is a form of Celestite. Angelite is also known as Anhydrite. 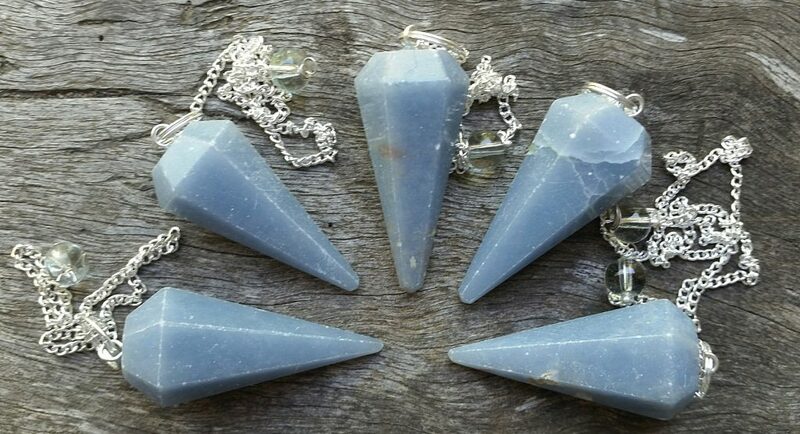 Angelite is a high vibrational stone that as its name suggests allows you to connect to higher vibrational beings and strengthen your bond. It will assist in developing your psychic abilities including intuition. It will allow you to experience vibrational shifts in order to transition to a higher level of ascension. It is a very soothing and calming stone that helps to clean blockages particularly in the Throat and higher Charkras. Healing – Unlocks meridians when put at the feet. Helps to balance thyroid, repairs tissues & blood vessels. A diuretic it is useful in weight control. Can be used in all meditations particularly when strengthening the aura and connecting to higher vibrational beings. Wonderful as a healing tool particularly when working on the throat. Placed over the relevant area (throat) during healing sessions. DO NOT use water on Angelite.